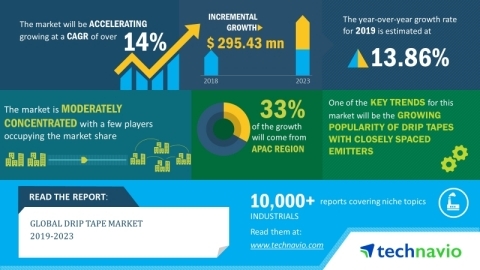 The research report on the global drip tape by Technavio predicts the market to post a CAGR of over 14% during the period 2019-2023. The growing demand for food products has led farmers to adopt practices such as greenhouse farming which offer better output. Apart from this, greenhouse farming also protects the crops from harmful effects of adverse weather conditions. To further boost the adoption of greenhouse farming, several government agencies are providing grants to farmers. This growing popularity of greenhouse farming is bound to increase the demand for drip irrigation systems and drip tapes during the forecast period. As per Technavio, the increasing adoption of single-use drip tapes among farmers will have a positive impact on the market and contribute to its growth significantly over the forecast period. This global drip tape 2019-2023 research report also analyzes other important trends and market drivers that will affect market growth over 2019-2023. The spacing between emitters needs to be accurate for maintaining the suitable flow rate for different soil and crop types. Drip tapes with closely spaced emitters are particularly useful for salt-sensitive crops where the salinity of the soil needs to be diluted. These types of drip tapes provide continuous soil wetting which can be configured as per requirement without raising the pressure. "Drip tapes with closely spaced emitters eliminate the need for secondary sprinkler systems as they provide the desired rate of soil wetting required for seed germination. Moreover, such drip tapes distribute water to the planting bed thereby reducing the chances of weed formation. These advantages of drip tapes with closely spaced emitters will boost their popularity among farmers and drive the demand for drip tapes," says a senior research analyst at Technavio. This research report on the drip tape market segments the market by product (labyrinth drip tape and inner inlay drip tape), end-user (outdoor farming, indoor farming, and others), and geography (APAC, Europe, MEA, North America, and South America). The labyrinth drip tapes segment dominated the global drip tapes market. These drip tapes are highly resistant to clogging which allows for the extended use of drip tapes in the agricultural field. The maintenance cost associated with labyrinth drip tapes is also low which helps in its increased adoption among end-users. APAC accounted for the highest share of the market in 2018 due to the subsidies provided by the governments for installing drip irrigation systems in agricultural fields. Various government initiatives to boost the sales of new units of drip tapes in APAC are contributing to the growth of the market in this region.